Thank-you for playing in the 12th Annual Johnston Meier Insurance Vancouver Open presented by ICBA Benefits. I hope you all enjoyed your tournament experience this year at Vancouver’s three Premier Park Board Courses: McCleery, Langara and Fraserview! From the feedback we have received both on and off the golf course and in several post-event emails and social media, it sounds like everyone was very impressed with the premier conditions and playability of all three Vancouver Parks Golf Courses. Thank you for all the positive feedback you have given us for bringing the Vancouver Open back to Vancouver’s Premier Public Golf Courses. Congratulations to all three Park Board Superintendents, Dennis Luick (Fraserview), John Cartlidge (McCleery) and Pete Rodrigues (Langara) for presenting all three courses in ideal conditions for the Championship. You truly went above and beyond to provide the players with PGA Tour-like conditions throughout the week. You can find all Professional and Amateur Prizing on our website here: https://vancouvergolftour.com/results/. Just click on the Title of the tournament to see the prize results and click ‘Photos’ if you want to check out some great action shots from the weekend. They are downloadable from our Facebook page!! If you were unable to stay for the prize presentations, and you have won a prize, please email me to make arrangements to pick up your prize either from our home office in Burnaby or at one of our final 2 events on the VGT Schedule (Sept.15th @ Pagoda Ridge or Sept.28th @ Meadow Gardens). All Skins moneys are brought to the next VGT event and can be collected there. If you are absolutely sure you cannot attend one of the last 2 events, please send your address and we will send a cheque for your skins winnings. If you were able to come out and watch some of the Championship you will have witnessed some amazing shots and some great scores come out of all 3 Vancouver Parks courses, and that the final hole proved to be more dramatic than we all first thought it would. 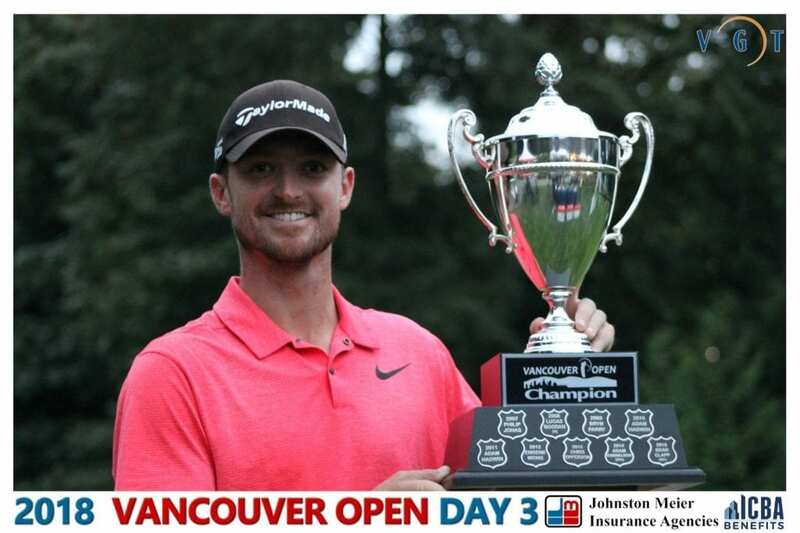 But in true fashion, Oregon’s Nick Sherwood played an unbelievable recovery shot from 200 yards out and 2-putted for the win and was declared 2018 Vancouver Open Champion on Sunday night! Nick played some outstanding golf throughout the weekend, and ultimately it was his consistency that allowed him to prevail, topping local Amateur sensation Chris Chrisologo by just one shot and the next best Professional (Greg Palmer) by 2. Sherwood claimed an $8,000 First place cheque that he will gladly take down south with him on his next journey to play the PGA Tour Latin America circuit that commences next week. For Our Amateur Champion, it was Chris Chrisologo’s first attempt playing the Vancouver Open. 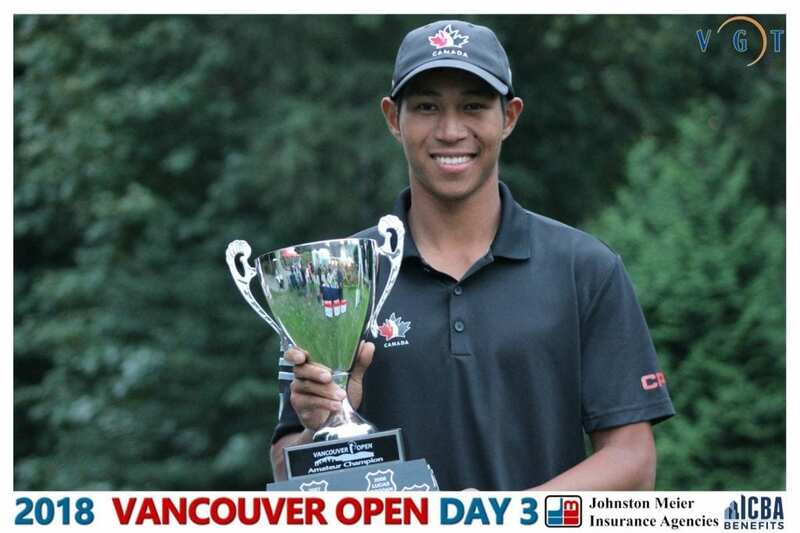 With his win he can now add the Vancouver Open Amateur Title to a number of accomplishments this year including impressive wins at the South American Amateur and the BC Men’s Amateur, and holding Low Amateur honors at the RBC Canadian Open where he shot a four day total of -9 against the top PGA Tour players in the world! On that note, the 2018 Vancouver Open & Charity Pro-Am are in the books as arguably the most successful event the VGT has operated in the 12 years of existence. The Pro-am was a complete sell-out and our 54-Hole Championship was the largest turnout we have had (176 golfers) since our last visit to the Parks Board Courses in 2013! Special thanks to everyone involved with the Vancouver Parks Board for inviting the VGT back to Vancouver’s 3 Premier Public Golf Courses after a 5-year break. We truly appreciate the hospitality we received from all of your staff and management throughout the week. It has been an amazing experience for our team and for the players hosting the Vancouver Open back in the City of Vancouver where it truly belongs. Your support of our flagship event is greatly appreciated! Thank-you for allowing us to provide a PGA Tour like experience for our local Pros and Amateurs at our 12th Annual Championship! Some final thank-you’s to those who made the 2018 Vancouver Open possible. First off, thank-you to our Vancouver Open Title Sponsor, Dave Ebner of Johnston Meier Insurance Agencies and to our Presenting Sponsor Todd Castonguay of ICBA Benefits. And to our Charity Pro-Am Title Sponsor Maui Jim and Presenting Sponsor Travis Mathew, thank-you for making this year’s Pro-Am the best in our 12 year history! The welcome gifts and Travis Mathew experience were really well received! Running a golf tour takes passionate individuals who are willing to dedicate their time in pursuit of the VGT mission statement: ‘Preparing Tomorrow’s Champions! I am in a debt of gratitude to the individuals who allow VGT to operate successfully week-in-week-out. Our volunteers are an integral part of the Tour and as such, we would like to thank the 40+ volunteers who have graciously donated their time to helping us execute the 2018 Vancouver Open! And a final shout-out to our Tour’s Title Sponsor, IGA Stores of BC (and friends at Canada Bread), and our Order of Merit Sponsor Cleveland Golf/Srixon Canada. VGT would not be here without your incredible support and the support of our many other Major and Supporting Sponsors these last 12 years! We are tallying up all the receipts from our Charity Pro-Am silent auction and live auction and will make an announcement shortly about the total donation we are making to our Charity of Choice, the FIRST TEE of GREATER VANCOUVER YMCA. VGT would like to thank each and every one of you for playing, supporting, sponsoring and sharing our messages thru social media. We couldn’t do it without you. Thank-you! We want to ensure that everyone gives us their feedback about the event, from the format of the Pro-Am, to their experience at the 54-Hole Championship as a whole. We want to continue to deliver the best experience possible for our golfers and your feedback is going to allow us to do that! Thank-you! Until we see you at one of our next events!